A battle between the American Civil Liberties Union, the League of Women Voters, Democratic Party groups and others and the state of Ohio commenced today in U.S. District Court over the state's GOP-drawn congressional districts. The plaintiffs are arguing before a three-judge panel in Cincinnati that the way the state draws its congressional districts unfairly devalues the votes of minorities and others who generally vote Democratic because the process allows for gerrymandering, or designing districts with political advantage in mind. 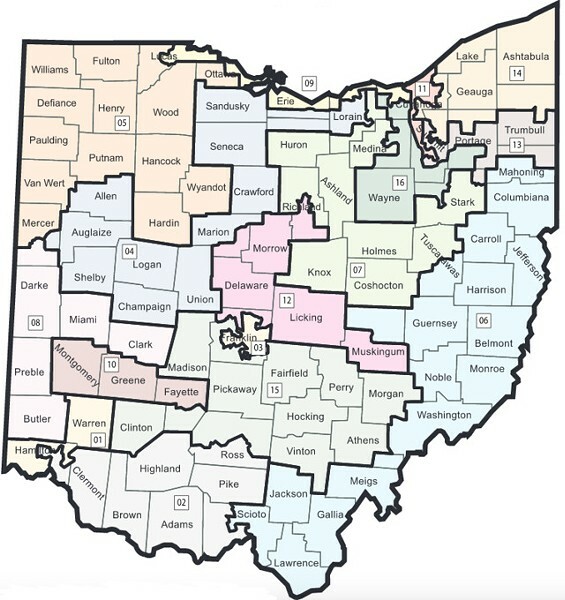 Ohio's current congressional map was drawn by a Republican-controlled panel in December, 2011. From 2012 to 2016, Republicans in Ohio won 56 percent of the state's votes for U.S. House candidates. But they netted 75 percent of Ohio's seats in the House. In 2018, that pattern repeated, with Democrats getting only four of the state's 16 seats. That's because many of the state's congressional districts are drawn so that races in them aren't competitive, groups like the ACLU say. Instead, large numbers of reliably conservative voters are concentrated in districts like Ohio Congressional District 1, which encompasses the west side of Hamilton County and deep-red Warren County. U.S. Rep. Steve Chabot has held that district since the 1990s, save a brief exception in 2009, when Democrat Steve Driehaus defeated him for a single term just before the districts were redivided. Many of those districts are drawn — sometimes with convoluted shapes — so as to divide up major population centers like Cincinnati, which have more liberal and minority voters. Heavily-urban Cuyahoga County, for example, is split four ways, each small section mixed with much more conservative suburban and rural areas. "Although the number of Democrat and Republican voters in Ohio is roughly even, gerrymandering has allowed the Republican Party to secure 75 percent of the seats in the U.S. House of Representatives in every election since the map was drawn," the suit from the groups pushing for changes to the state's redistricting process reads. But Republican state officials say that the current map was drawn by Democrats and Republicans, which both gave up a district when the state lost two congressional seats due to a dwindling population. They also point out that the state will get a new congressional district map after the 2020 Census anyway. "The process of redistricting is inherently political and it needs a political solution," Ohio Attorney General Dave Yost said last month. "We have a new process in Ohio. And it's a much better process than what's gone on since the 1960s." Currently, the party controlling Ohio's General Assembly and governor's office has almost complete control over how congressional districts are drawn every 10 years. But in May last year, Ohio voters approved Issue 1, which seeks to reform the redistricting process. Under the reforms, legislatures will still draw the maps, but at least half of Democrats and half of Republicans in the legislature will have to approve the maps. If they can't agree, a seven-member, bipartisan lawmaker commission will take over the redistricting, with at least two votes from members of each party needed to approve a map. If that also fails, the legislature can then draw a map without any restrictions — but it will be good for only four years, not 10. The groups bringing the suit, which they first filed last year, say that Ohioans shouldn't have to wait for the coming Census to have districts that represent them.